Located in the heart of the Lane Cove Village on Longueville Road, Lane Cove Optical is set alongside cafe’s, boutiques and just a stone’s throw from the ever vibrant Lane Cove Mall. We’ve been providing unparalleled Optical Health Care services for over 40 years and to this very day embody the spirit that Noel Gladen brought to the business back in 1974 – that is your eye care is paramount. Technology has evolved dramatically for many of the products we sell and the testing services we offer and we’re always making sure we’re up to date technically. Importantly, we’re also very determined to keep up to date with our clients and the community we work in and maintain the reputation as Lane Cove’s premier Optometric service provider. We offer everything you’d expect from an Optometrist & Dispensary as a matter of course. What we also bring is personalised care and a desire to see you leave our premises with better vision than when you walked in; having received service from a trusted health care professional; and having bought quality glasses, spectacles or sunglasses that fit your budget and ‘look’ because they are right for you – not because we think they will make us the most money. We look forward to serving you in the very near future. Noel Gladen started Lane Cove Optical back in 1974, with the vision to create a strong, customer service based optometry business to serve the people of Lane Cove and its surrounds. Since the 70’s ‘The Cove’ as it’s known has grown, as too has the business. Joining his father fresh out of College, Geoff Gladen has been chief optical dispenser and the face of Lane Cove Optical for the last 15 years. Geoff is active in the community and plays a hands on role cutting every pair of lenses, fitting the spectacles and ensuring his customers receive not only top notch service but fantastic products as well. Bonney has been our full time optometrist for the past 5 years. 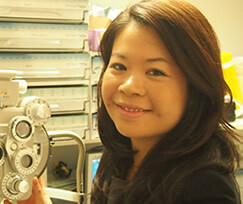 She graduated from the University of New South Wales with a Bachelor of Optometry. She is currently completely the Ocular Therapeutics course at UNSW, which will enable her to prescribe therapeutic ophthalmic medicines. She also has a special interest in glaucoma co- management, ocular disease and children’s vision. She works closely with local ophthalmologists and medical practitioners. Bonney is a member of the Optometrists Association Australia.